Surrounded by combatants and taking on a hail of weapons fire, my airship was severely damaged and being held on by a thread. As I navigated around several rock formations attempting to flee from the fog arose another contestant and one that I hadn’t been the nicest to. Within seconds, missiles came swarming my way to my demise finishing me off and forcing a total loss for that round in the season. As I hobbled back to the hub, the Announcer appeared on the massive screen in front of us all, and I was in the bottom of the leaderboard. The other AI contestants voted, and of the two of us in the last places, I was kicked out, and my season was over. This is the chaos and action of Bow to Blood: Last Captain Standing, an arena combat game with airships set in a fantasy televised show akin to Survivor, where there can be only one champion each season. Bow to Blood is what happens when you take the core elements of The Hunger Games and infuse futurepunk airships in a science fiction backdrop for a single player game. The premise is that you’re competing to become the Champion of the Arena, a broadcast fictional show complete with eliminations via voting, alliances, and all the goodies that come from a reality TV program. You are the Freelancer and have grown up watching the Arena, but now you’re at the command of your own nimble and vicious airship with a small crew ready to tackle all of the challenges that await you. Aboard your ship in the captain’s chair, you’ll be flying in a first-person view as you navigate around planets scoring points and completing objectives. The game is broken up into seasons, and each is comprised of 7 rounds, with each round generally requiring you to visit two locations before a culling/voting occurs. There’s a lot of gameplay here and one of smartest decisions was to make many elements procedurally generated. This opens up a lot of replayability since opponents, regions and objectives will be semi-randomized with every new season you start in an attempt to avoid stale repetition. However, I did find that the randomization wasn’t as strong as I would have desired. At the beginning of each round will be a primary objective or game mode that in most cases requires you to find a portal key that unlocks your ship’s hyperdrive to leave the region safely. However, you’re enticed to stick around and collect extra championship points by blasting drones, other AI contestants, and various AI enemies, or doing some basic mining of materials. This becomes a risk/reward endeavor as your ship’s hull and system’s damage carries over between each of the two rounds, so treading cautiously is advised. The tide can turn against you in a moment’s notice I found, and getting wrecked in a round gives you no round points which in turn hurts your overall season scoring. Combat and navigation offer a reasonable amount of strategy and management, more so than I would have originally expected in a title like this. Similar to games like FTL or Bomber Crew, you’ll be charged with ordering your crewmates into ship positions. For example, placing a person in the Shields control area will allow for faster recharging of the ship’s shield. There are 4 stations total, and in my play time I had only 2 crew members so dependent on my situation at any given point, I was swapping around those shipmates quite frequently. There’s also a system to reallocate a limited resource within your aircraft to other elements, such as boosting your advanced weapons and such. This I found was more for advanced players that really want to micromanage those elements and try and pack the most punch as possible during rounds. I personally struggled to see significant changes when modifying these, but I’m sure others will find the appropriate nuances. You’ll find two more management aspects aboard your ship as well. One is the advanced weapons systems. These come in the form of powerful, but limited use guns, such as the beam cannon or missiles. Activating these at critical junctures in a round can really get you out of a jam. The other is a shotgun/close range weapon that’s used for enemies that attempt to board and sabotage your ship’s systems. Thankfully all of these mechanics are mapped to the Joy-Con directional pad for easy access and swapping. I had very minimal troubles managing and flying in sync at any given point, which is really a strong positive for the game. If managing a combat-ready airship wasn’t enough, Bow to Blood also pits you against 7 other competitors each season, and just like your favorite episode of Survivor, alliances will be made and enemies forged. Voting off the ‘island’ is a guarantee, and more than a fair share of backstabbing will be afoot. The game does a solid job at infusing drama at plenty of intervals during your season. Between each of the rounds, you’ll find yourself inside your Captain’s Quarters, which in itself is pretty neat as the space will become decorated and show off memorabilia based on certain milestones you achieve. You’ll receive message calls from other Captains that are interested in striking up deals, intimidating you and others. In most cases you’ll have to respond, and your answer will affect the relationships of all opponents. Now just in the case of a reality show, the more friends you make during your time in a season, the better chances you won’t get slaughtered by them, and should you fall to the lower scoring ranks, the less chance you’ll be culled from the competition. These same opposing calls will also happen pre-round and even during a round with again varying degrees of urgency or requirement. I was often given a buzz to help another Captain clear an area of enemies so they could get a treasure cache. If I aided them, and then stole that cache, well, it meant down the road a few rounds, they’d find a way to repay my thievery. For the most part, these drama points are set up well, but some of them I received a too frequently between the few seasons I played. 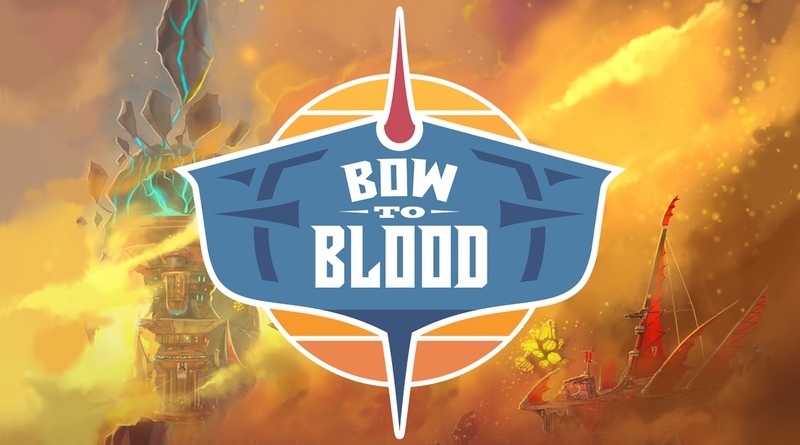 With the combination of rather intense combat and situational objectives, airship management, and then trying to deal with the cliques and drama of your opponents also trying to take the championship, Bow to Blood keeps you busy. However, it’s not without room for improvement. I personally would have loved more attention to how sequential seasons could be tied together. Maybe in the form of paint schemes on deck, or other progressive unlockables based on my placement in a season would have helped keep things cohesive. Right now, when you die or complete a season, there’s very little reward or incentive to play another. I also found that although many elements are procedural, the pool of selection was a bit thin. When entering my second season I was immediately presented with the same first few objectives and regions that I had done in Season 1. Bow to Blood: Last Captain Standing delivers an immersive airship combat experience coupled with relationship drama and alliance building with your arena opponents. The thematic premise of this being broadcast similar to a show of Survivor works to the game’s favor and creates added decision making apart from the core gameplay. Not enough randomness leads to some repetition after a few seasons, but the game is still very fun to play!